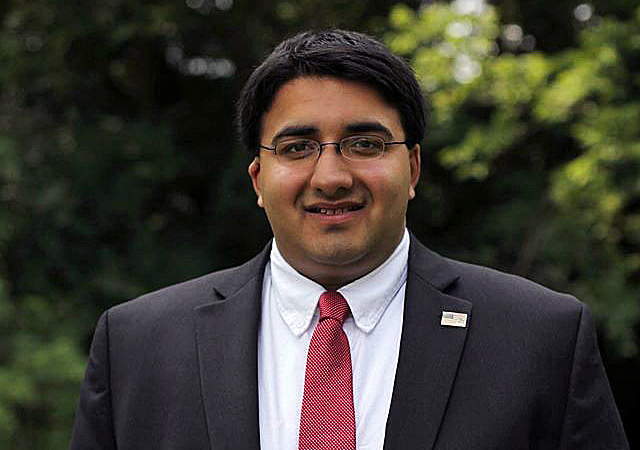 OSU graduate Niraj Antani is running for the Ohio House of Representatives for the 42nd District in Ohio. A recent Ohio State graduate is hoping to become the youngest sitting state representative on Nov. 4. Ohio State graduate Niraj Antani, 23, is the Republican Party nominee in Ohio’s 42nd House District. Antani ­­— who graduated from OSU in spring 2013 with a bachelor’s degree in political science — is currently a law student at the University of Dayton. Antani said a lot of people have criticized him for his age, but he sees it as an advantage. Antani was chosen as a replacement for the Republican Party in the 42nd District after incumbent Terry Blair died unexpectedly on June 26. The hardest part of his campaign was Blair’s death, Antani said. “I knew Rep. Blair pretty well. Having to do politics after a guy you knows passes away is hard. I try to keep Terry to heart,” he said. Antani, who said he had been interested in politics since he was little, said the most rewarding part of this campaign was the opportunity to do something of which he was proud. “I have the opportunity to do things I believe in. I fundamentally believe that this generation should have a voice,” he said. Antani also stressed the importance of his generation voting in state elections. Antani is running against 62-year-old Democratic opponent Patrick Merris, who is currently a councilman in West Carrollton, Ohio. Merris’s campaign did not return email and phone requests for comment by Tuesday evening. And even though Merris is almost three times his age, Antani said OSU prepared him for the race. While at OSU, Antani was involved in numerous organizations including Undergraduate Student Government, University Senate, Council on Academic Affairs and College Republicans. Sam Zuidema, the chairman of OSU College Republicans, said he is glad his friend is running. “The College Republicans are thrilled that one of our own is running for the Ohio House of Representatives. As a personal friend of Niraj Antani, I know that he will work hard and succeed at representing his constituents when he wins his election next Tuesday. He will bring a new voice to the Ohio House and will fight wholeheartedly for responsible government and the American dream,” said Zuidema, a fourth-year in history and political science, via email. Former USG vice president Josh Ahart said Antani’s time in USG prepared him for this campaign. OSU College Democrats did not respond to multiple email requests for comment. Antani joins in the ranks of other former USG members who are on the ballot this November. Former USG President and 2011 graduate Micah Kamrass is currently running for state representative of the 28th Ohio House District. Josh Mandel, a 2000 OSU graduate and former USG president, is running for his second term as Ohio Treasurer. And John Carney ­— who got his undergraduate degree from OSU in 1998 and his Juris Doctor in 2001 — is running for state auditor. This is not Antani’s first campaign, though. He ran for USG president in 2012, but lost to Taylor Stepp and running mate Kevin Arndt. Antani is also in good company of politicians who have lost their run at USG presidency. Gov. John Kasich ran for both president and vice president of USG and lost both times. The 42nd District of Ohio has not seen a democratic candidate in two decades, leaving Antani confident for November. “I will hopefully be very happy Nov. 4,” he said. An earlier version of this story incorrectly referred to Terry Blair as having been a state senator when in fact, he was a state representative. I knew him in college. I’m sure he will continue the Republican crusade against birth control since he has certainly never been with a woman before. If you “fundamentally believe that this generation should have a voice,” shouldn’t that voice be progressive and not that of Ye Olde Boys Club, the GOP? Sigh. Forever making raspberry noise. Wow you guys are nasty. Be a little more proud that someone is taking an interest in civic involvement and improving society and buzz off. What have you done for society and government? Sniped at someone online? This must be one of those unique campaigns where the candidate avoids physical contact with voters. That guy reeked when he was campaigning for USG. Rather than denigrate this young man, we should just pray for his soul and pray the he find salvation. This is a man who said in another article that he had 7 or 8 years of political experience. Lets do a little math. He was saying that the experience he gained at age 15 or 16 prepared him to work in the government, work for the people, help improve the job situation, and so on. The man has only ever had 1 real job in his entire life and that was at chucky cheese. He does not know enough about the real world to help govern anything. I also noticed he has not said word one about vets. I am a vet. I know many vets both old and young. Some even coming home from fighting in the middle east. I guess he has no interest in stating what he will do for that part of the district that gave him the freedom to run. I do not attach myself to any party. I believe in common sense. He is asking for a management position while making statements that would make most business owners tell him to kick rocks. He needs more experience, he needs to to actually know what its like to live in the real world outside of school. Personally I think that all politicians should serve in the military at some point, but that is just my opinion and I can see where it may not be practical. Would just be a preference for me. As for this kid, and he is a kid, he has know place in the state government, or in helping determine the best path for those who have more knowledge and wisdom than him. Vote for the other guy if for no other reason than the idea of a 23 year representative is a joke. Ohio needs experience. All those who criticize this young man should really reflect back upon themselves. This kid might not be all too sure about his place in the party but he’s gotta start somewhere if this is the career path he chose. Atleast he achieved a lot for his age compared to many that I know that refuse to grow up even in their 40s or 50s.